Are you planning on adopting a dog? Does the long list of different breeds confuse you to pick one of them? It is true that your love for dog is irrespective of their breed and you may love him/her unconditionally. But, there are many other factors like the size of your home, number of family members, the presence of a child, etc. that may require a second thought on the breed selection process. Apart from these attributes, it is also important to dissect about your expectations from the dog. Before you decide to adopt a puppy, try to spend time with his parents. By doing this, you will be able to know how your pup may grow and what traits might he carry. There is a vast variety of dog breeds and this may enable you to select a perfect breed for your family without compromising on any of the expectations. 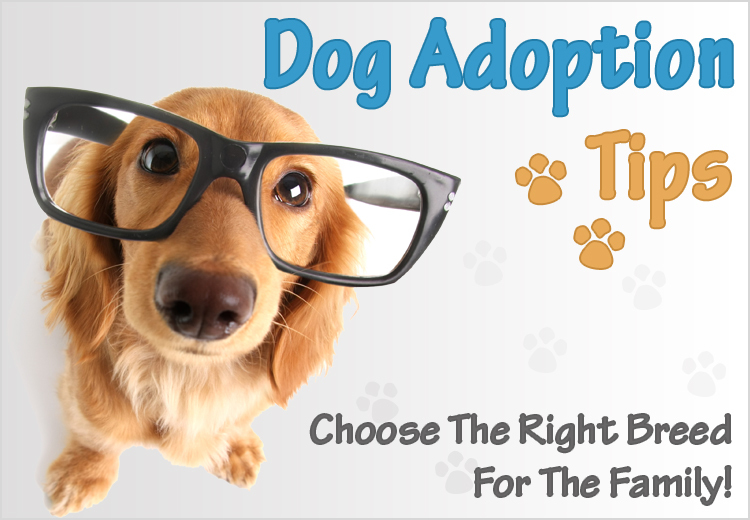 Let’s find the right breed for your family! Introspection- Things to think upon! Before you select a specific breed, introspection about your requirements and the surroundings is very necessary. Some breeds are highly energetic and may need more amount of physical and mental exercise. If you stay outdoors for most of the time, you may need to select the breed accordingly. Similarly, if you live in an apartment, not all breeds may be suitable for the confined spaces. Grooming requirements and your budget should be proportional to avoid the unintentional expenditures. The presence of a child or more number of family members, are also the factors to consider. Your home- Is it an apartment, residential house with a big yard or a row house? If you live in a residential house that has a big yard, you may not need to worry about the breed. Any breed may suit your environment. But, if you are living in an apartment, there are many things to consider. Generally, it is believed that small breeds are perfect for the apartment residents. Though, the size has nothing to do with this factor. Many small breed dogs have an extreme energy level, which may require a lot of exercise. And, if you don’t have enough time and space for it, selecting a pooch on the basis of its size may turn out differently for you. Choosing a long coated dog may benefit you on the cleaning side. Canines with longer coats shed less and though you may need to groom them regularly, you may not need to clean your apartment frequently. According to the some of the surveys, these breeds are well suited for apartment living: Suissex Spaniel, Shih Tzu, Shiba Inu, Yorkshire Terrier, Toy fox Terrier, Silky Terrier, Yorkipoo and Rat Terrier. Affection- Is it all that you seek from your to-be-pet? There is a section of the people that decides to adopt a pooch to feel their love and affection. If you are living alone, then the breeds that are especially affectionate may alter your day-to-day life. These breeds could also be the best for families having more than 3 members or is a complete family with parents and children. These breeds may help in strengthening the bond between the members of the family prevails through tough times.If you are in love with the small breeds, then these loving dogs could be great for you: Papillon, Maltipoo, Maltese, Pomeranian, Puli, Pug, Shih Tzu, Staffordshire bull terrier, Yorkipoo, etc. There are many medium sized breeds that may match your expectations of affection: Xoloitzcuintli, Whippet, Vizsla, Tibetan Mastiff, Siberian husky, Swedish Vallhound, Scottish deerhound, Rhodesian ridgeback, Golden retriever, etc. Great Dane, Great Pyrenees and German shepherd are some of the large breeds that show boundless affection to their family. Novice dog owner- Breeds to start your companionship with! Parenting a tyke is not an easy task. It requires a lot of patience and alertness to carry the responsibilities that a pet may bring with him/her. If you are adopting a dog for the first time, there may be things that you might not be able to pull it right. So, the breed that you select must be tolerant and forgiving of your mistakes as a first timer. Things may be much in control if the dog is easy to train and does not bounce back on your inconsistencies. So, choose your first ever furry companion from these breeds that can be trained easily and are known for their tolerant capacity: Scnoodle, Poodle, Puggle, Labrador retriever, Maltese Shih Tzu, Golden retriever, Maltipoo, Papillon, Norfolk terrier, Brittany, Bichon frise, Cardigan welsh corgi, Pug, Peekapoo, Cockapoo and Havanese. Kids live in the moment and react without any second thought, whether it is crying, screaming with joy, snatching things or being mischievous. If you are deciding to adopt a pooch when you are already parenting a kid, the dog must be able to bear the abruptness of a kid’s behavior. It is believed that toy breeds should be chosen when a kid is around. But, this is entirely wrong. Size has no strings attached to the compatibility with kids. If you look at a Chihuahua, he may seem all cute and friendly, when that breed is not at all kid friendly. On the other hand, Boxers and Staffordshire terriers that are believed to be fierce are extremely tolerant and family friendly. So, search everything about the breed that you are interested in before adopting it, especially when you already have one kid. Some of the benevolent breeds that are kid friendly are: Staffordshire bull terrier, Small munsterlander pointer, Pharaoh hound, Puggle, Golden retriever, Labrador retriever, Harrier, Bull terrier, Brittany, Boston terrier, Basset hound, Beagle, American water spaniel, Cardigan welsh corgi, etc. Though these breeds may be kind, it is not recommended to keep your kids alone with any of the breeds. Things might turn bitter if they are left unsupervised. An adult should always be there when your child is playing with the pet. With proper research and filing your needs into different sections, you may be able to adopt a perfect breed for your home. These are some of the factors that might be a concern while you plan to adopt a dog. We will be right back with the other part with more number of breeds and factors that might help you in the selection process. Think things beforehand and enjoy the companionship with your chosen breed of pet!